Make a glamorous style statement with this gorgeous pendant from the Trio Collection by Hot Diamonds. 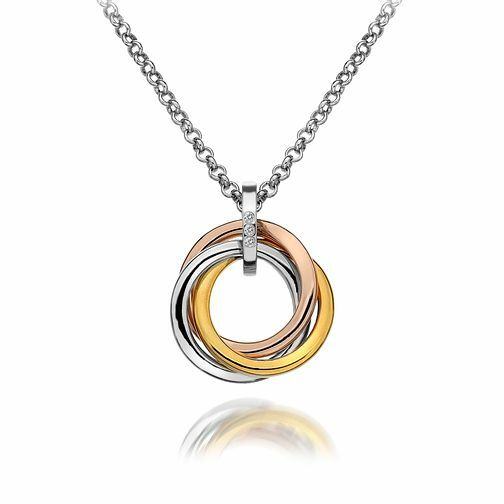 Crafted from sleek sterling silver, with yellow and rose gold plated accents, this pendant features an intertwined triple hoop design, and is finished with three shimmering diamonds for a touch of the signature Hot Diamonds sparkle. Hot Diamonds Trio Collection Three Colour Diamond Pendant is rated 5.0 out of 5 by 2. Rated 5 out of 5 by Anonymous from Simple but stunning pendant. Three lovely colours, two settings on the chain length. A simple but stunning necklace. Shame there are no earrings to match. Rated 5 out of 5 by Anonymous from Stunning piece Beautiful and solid. Looks amazing on. The length is just right, offering two options on the chain. Love it.